Mr Thirlwell explained the gradual buildup of support for the unique taste of their Saint Lucia chocolate grades, helped by winning 22 awards and continual promotion in their 100+ UK stores. Prior to 2006, before Hotel Chocolat, Saint Lucian cocoa beans were only ever exported to be mixed with lower grade beans and never celebrated as a pure single origin taste in their own right. After Hotel Chocolat invested in a cocoa estate on the island, the full deliciousness of Saint Lucian chocolate could be offered to the world, competing alongside other high quality bean countries such as Ecuador, Dominican Republic, Madagascar, Honduras, Jamaica and Trinidad. Delegates at the high-profile event expressed support for the company’s pioneering “Engaged Ethics” approach to cocoa growing which had led to a sustainable upswing in the prospects of cocoa growing on the island, with an estimated 5,000% increase in cocoa GDP in the first decade due to a substantially higher price plus a higher yield. An estimated 300 jobs have been created and cocoa growing is now enjoying a re- naissance across the island. The 25th World Travel Awards this month named Boucan by Hotel Chocolat Leading Hotel of Saint Lucia 2018. Hotel Chocolat stocks its Saint Lucia chocolate in 115 company owned shops across the UK and Scandinavia and has announced the opening of locations in New York and Tokyo this year which will be well stocked with Saint Lucian chocolate.. 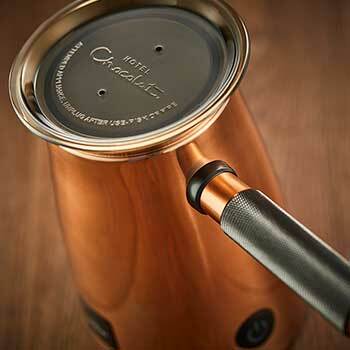 Luxury British cocoa grower and chocolatier Hotel Chocolat was founded in 2004. Its aim: to make chocolate exciting again by following three guiding principles – authenticity, originality and ethics – that remain central to the brand’s success today. With its organic Rabot Estate cocoa plantation and Boucan Hotel & Restaurant in Saint Lucia, a chocolate-manufacturing facility in Cambridgeshire and stores and cocoa cafés across the UK and internationally, Hotel Chocolat occupies a unique space – being able to link all aspects of chocolate from the tree to the consumer. Growing up in the West Indies inspired a lifelong love for these wild islands and decades later led Angus back, to become a cocoa grower on the oldest and most beautiful cocoa estate in Saint Lucia. To say that Angus is passionate about cocoa is an understatement. As he willingly admits, it’s more of a life-long obsession. Together with his business partner, Peter Harris, he founded Hotel Chocolat in 2004, with the aim of creating chocolate that would excite the senses of everyone who tried it. Angus religiously eats chocolate every single day and grates cocoa over his breakfast eggs, as well as tasting and approving all the recipes that Hotel Chocolat produces. He’s as at home in the chocolate Inventing Room as he is in the boardroom or walking among the cocoa trees on our Saint Lucian plantation.